After being catured, the pirate told about a mysterious treasure. The captain of the Majesty’s frigate decided to look for it. 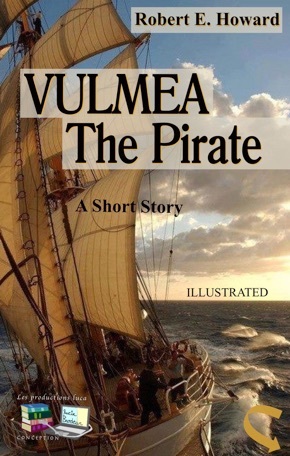 Published first as Black Vulmea's Vengeance. Out of the Cockatoo's cabin staggered Black Terence Vulmea, pipe in one hand and flagon in the other. He stood with booted legs wide, teetering slightly to the gentle lift of the lofty poop. He was bareheaded and his shirt was open, revealing his broad hairy chest. He emptied the flagon and tossed it over the side with a gusty sigh of satisfaction, then directed his somewhat blurred gaze on the deck below. From poop ladder to forecastle it was littered by sprawling figures. The ship smelt like a brewery. Empty barrels, with their heads stove in, stood or rolled between the prostrate forms. Vulmea was the only man on his feet. From galley-boy to first mate the rest of the ship's company lay senseless after a debauch that had lasted a whole night long. There was not even a man at the helm. But it was lashed securely and in that placid sea no hand was needed on the wheel. The breeze was light but steady. Land was a thin blue line to the east. A stainless blue sky held a sun whose heat had not yet become fierce. Vulmea blinked indulgently down upon the sprawled figures of his crew, and glanced idly over the larboard side. He grunted incredulously and batted his eyes. A ship loomed where he had expected to see only naked ocean stretching to the skyline. She was little more than a hundred yards away, and was bearing down swiftly on the Cockatoo, obviously with the intention of laying her alongside. She was tall and square-rigged, her white canvas flashing dazzlingly in the sun. From the main truck the flag of England whipped red against the blue. Her bulwarks were lined with tense figures, bristling with boarding-pikes and grappling irons, and through her open ports the astounded pirate glimpsed the glow of the burning matches the gunners held ready. "All hands to battle-quarters!" yelled Vulmea confusedly. Reverberant snores answered the summons. All hands remained as they were. "Wake up, you lousy dogs!" roared their captain. "Up, curse you! A king's ship is at our throats!" His only response came in the form of staccato commands from the frigate's deck, barking across the narrowing strip of blue water. Cursing luridly he lurched in a reeling run across the poop to the swivel-gun which stood at the head of the larboard ladder. Seizing this he swung it about until its muzzle bore full on the bulwark of the approaching frigate. Objects wavered dizzily before his bloodshot eyes, but he squinted along its barrel as if he were aiming a musket. "Strike your colors, you damned pirate!" came a hail from the trim figure that trod the warship's poop, sword in hand. "Go to hell!" roared Vulmea, and knocked the glowing coals of his pipe into the vent of the gun-breech. The falcon crashed, smoke puffed out in a white cloud, and the double handful of musket balls with which the gun had been charged mowed a ghastly lane through the boarding party clustered along the frigate's bulwark. Like a clap of thunder came the answering broadside and a storm of metal raked the Cockatoo's decks, turning them into a red shambles. Sails ripped, ropes parted, timbers splintered, and blood and brains mingled with the pools of liquor spilt on the decks. A round shot as big as a man's head smashed into the falcon, ripping it loose from the swivel and dashing it against the man who had fired it. The impact knocked him backward headlong across the poop where his head hit the rail with a crack that was too much even for an Irish skull. Black Vulmea sagged senseless to the boards. He was as deaf to the triumphant shouts and the stamp of victorious feet on his red-streaming decks as were his men who had gone from the sleep of drunkenness to the black sleep of death without knowing what had hit them.